How to overdye your hand knits using food coloring. So as you might know by now, I'm expecting identical twin boys in June. So of course I'm thrilled to be knitting and crocheting as much as I can for them during my pregnancy. In fact, I'm doing a weekly vlog about it over on my youtube channel. 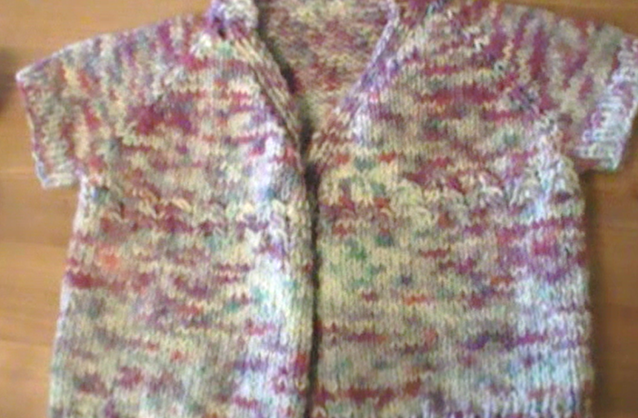 One project that I recently finished is the In a Pear Tree baby Cardigan. 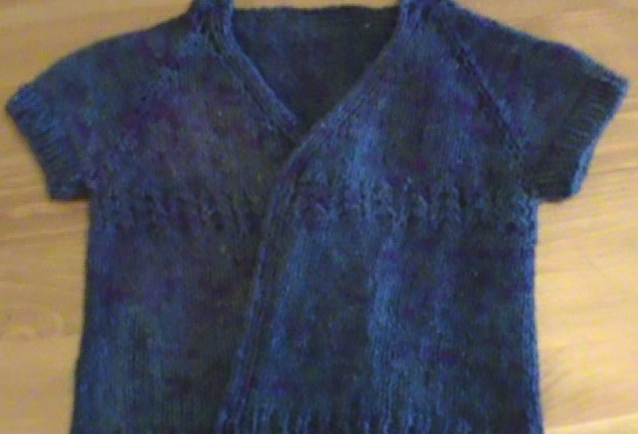 The pattern is available as a free Ravelry download, and was designed by the Barbarian Horde. I knit it using some yarn that I had recycled and dyed... thinking that since the yarn had both blue and pink in it, it might somehow be gender neutral. (I knit this up before I knew if I was expecting boys or girls). But yeah... it totally looks like a girl's sweater. So I thought, why not see if I can overdye it blue? So I got out my handy dandy dye pot, and dug out all of my blue food colouring and got to work. Oh I filmed it too! And I have to say, I think I like the result. Let me know if you've had any successful overdyeing experiments in the comments below! That's right... Pregnant.... with Twins! And I'm vlogging about it over on my youtube channel. I'll be posting weekly vlogs, every Monday, as I knit and crochet my way towards my June due date. Here are week 17-18, and week 19. I'm starting a new weekly vlog! I'll be posting a video every Sunday for the next 5 or so months. What's the topic? I'm knitting and crocheting for 3 now! That's right, I'm expecting twins this June, and couldn't be more excited to wrap them up in lovely yarnny goodness! Sharing my pregnancy progress as I knit and crochet my way towards welcoming my identical twins in June 2016! This week I reveal the babies's genders, show off 3 finished projects and one new cast on.